One Big Yodel: Minaret Ban: Fear or Discrimination? I have to say, I was shocked that the Swiss passed the minaret ban on Sunday. I've read reports that say the ban resulted from fear and not from discrimination. But my question is, isn't that the same thing? Not to mention, I just don't get the fear thing. What do the Swiss have to fear? No one has terrorized them. And I don't see what banning minarets accomplishes. Except to ask for trouble. I also don't get this: religious freedom is part of the Swiss constitution. But the Swiss are so democratic, they've somehow been able to vote against their constitution. You have to give them credit. Democracy doesn't get any better than this. There are four minarets in Switzerland. Four. None of them are used out of respect for the Swiss concern of "disruption." And please. If you want to talk disruption, I've got a clock tower across the street that tells me the time every fifteen minutes, 24/7. Never mind the Catholic church bells. Or celebrations called Badenfahrt. What do you think? 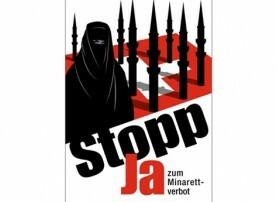 Is the minaret ban a step back for Switzerland? Can the Swiss ever claim they are neutral again? Is fear and discrimination the same thing? Personally I feel that there is religious freedom here in Switzerland. From what I have read, minarets are not essential to the practice of Islam. Instead of the vote coming from fear or discrimination, perhaps it boils down to "culture" and tradition. And simply what they want to see or not see in their skyline. Also, I feel for you with the church bells - they're nice when you hear them off in the distance, but having them right across the way has to be tough. Hi Susan, thanks for your comments. I too feel there is definitely religious freedom-but the question is should certain religions be limited in the constitution? And I don't really see how the minarets are a problem in the Swiss skyline. I've been traveling around the country now for over 3 years and have never really noticed a minaret. If anything, they would show that the Swiss actually practice what they preach--a neutrality and tolerance. Well the ban certainly got Switzerland some press coverage here in Bahrain for the first time since I've been here! Personally I think it's wrong. Bahrain is a Muslim country and yet we Christians are allowed to worship freely at churches - no talk of banning the cross or the church tower. And if there are only 4 minarets in la Suisse, surely this was a non-issue? There must have been a wider political agenda?? I think this is terrible. An American founding father once said that the majority should never vote on the civil rights of the minority, but it happens all the time (even in the US). I just don't understand what this "fixes" or makes better. The only that I can see, granted I do not live in Switzerland, is that it further marginalizes a minority group. But, the people have spoken. In general it seems that the Swiss have a love-hate affair with foreigners. They can't run business without them, but yet they always choose a group every year to be a scapegoat for a political campaign. As a foreigner in Switzerland, no matter what group gets picked on, I always seem to feel personally offended.